Ever since the concept of social media marketing came along, WeChat, created in the year of 2011 originally as messaging app, has been quickly developing to be a communicational tool for e-commerce and services. In Q1 2015, Tencent released official data of having over 500 million monthly active users in the world, with 80.9% of penetration rate among the Chinese Internet users. 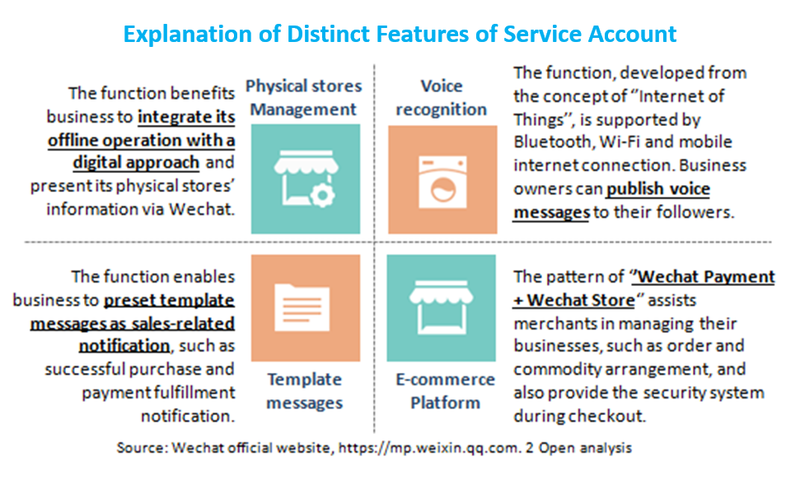 To serve your target audience at the right spot, either foreign or local enterprises must serious consider Wechat marketing as they expand their digital presence in China. Having your company to register a public account is the first step. There are two options available: subscription and service account. Then, which one suits your business more? It is difficult to say which one is better. Depending on the industry of your business and your expectations, you might have different perspectives in this matter. As the following table, we will review and compare the key features with you to help you make a final call. A subscription account might fit you more if you want to update your audience information on a daily basis. While in terms of e-commerce functions, a service account offers a more comprehensive scope than a subscription account does. 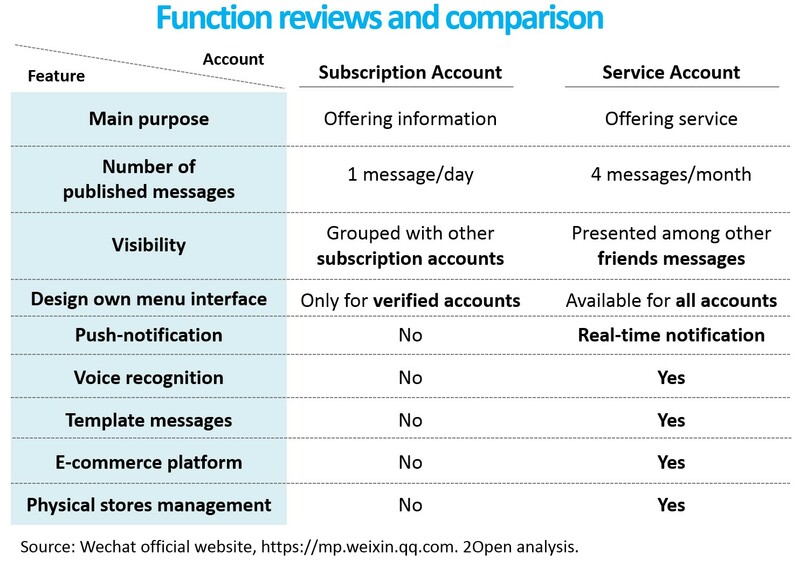 Regarding these distinct features of service account, the following explanation helps you further clarify the concept. As we emphasized, there is not an absolute answer to the question of which account is better but which one fits you more. After all, the most important thing is to identify your challenges, aim accurately at your target audience and develop the most appropriate strategy for social communication and marketing of your Wechat account. *Source:TECHINASIA, Asia Tech News for the World, www.techinasia.com, WeChat now has 500million monthly active users, published on Mar 18, 2015.